Thanks for inviting me to read this! I wore my dress several times it has been more than 10 years since I bought it and it reminds me of great and no so great moments. Karina, I was so thrilled to read your site. It is indeed a Brave New World in the land of blogging around the world. I have opened my eyes to the beauty that others are experiencing in their lives. I hope you come back often to see my art. Both of these paintings are wonderful. They give me the feeling of dresses being alive. 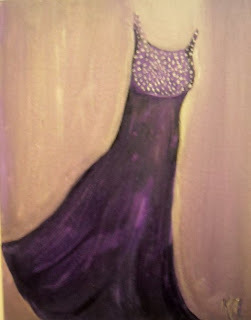 The right dress most certainly seems to have a spirit when it is worn. I had a card once with a painting of a coat and dress dancing, I loved that too. Thanks Tammie Lee. I do love to see the movement and flow in these works of art! Tammie Lee your photography is beautiful!! 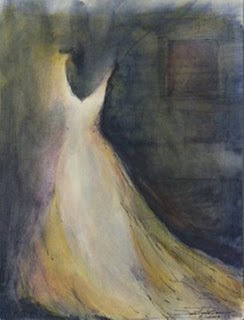 Both paintings are wonderful, but that white dress absolutely glows.